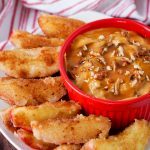 Apple Fries with Caramel Pecan Dulce De Leche Cream Dip is a favorite fall recipe that is full of sliced apples, cinnamon, sugar, cream cheese, pecans, and dulce de leche. This is the perfect Autumn and Holiday Dessert recipe that will have your friends and family asking for more — so be prepared to double the recipe! 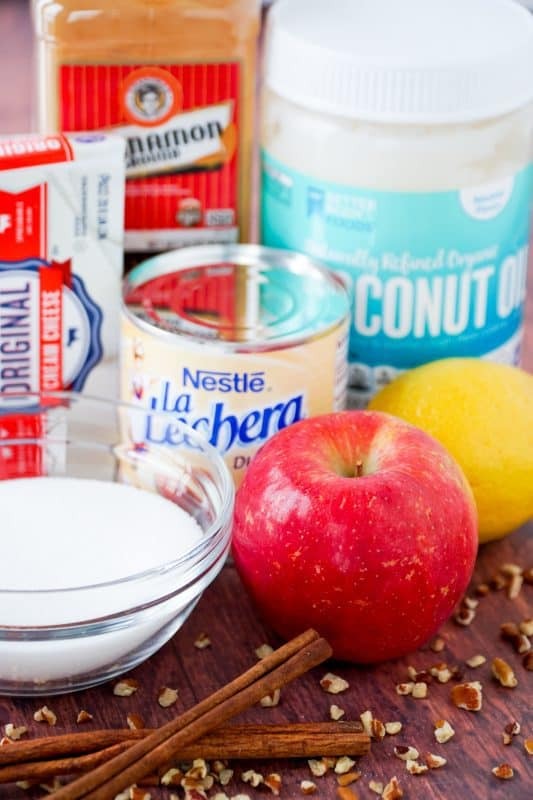 Our family absolutely loves apple desserts during the holidays, and this week we have a treat for you! 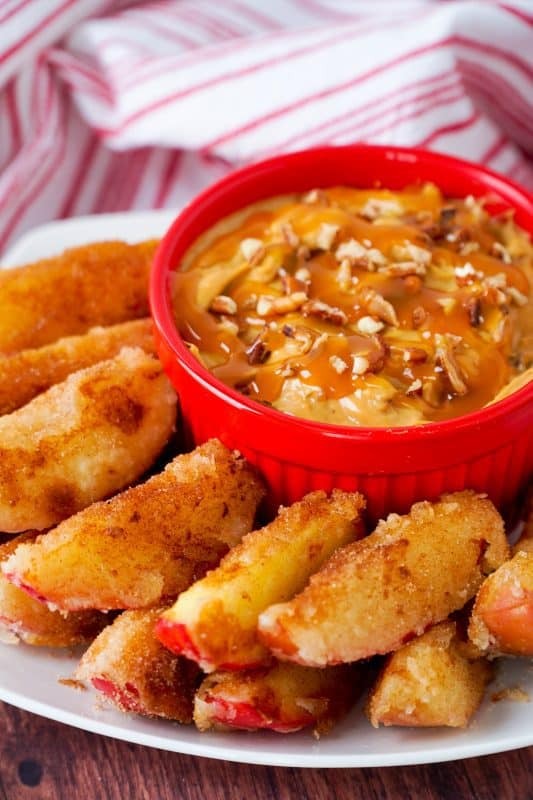 We’ve cooked up our all time favorite recipe — Apple Fries with Caramel Pecan Dulce De Leche Cream Dip. It has a bit of a twist on a traditional apple fries recipe that adds a few extra ingredients that are sure to make this a new family favorite for years to come. 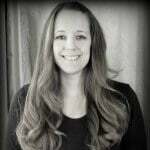 There is just something about your house smelling like a warm apple pie that makes me want to skip into the kitchen and whip up something delicious up for my family. My one requirement — it must be easy to make and out of this world delicious. 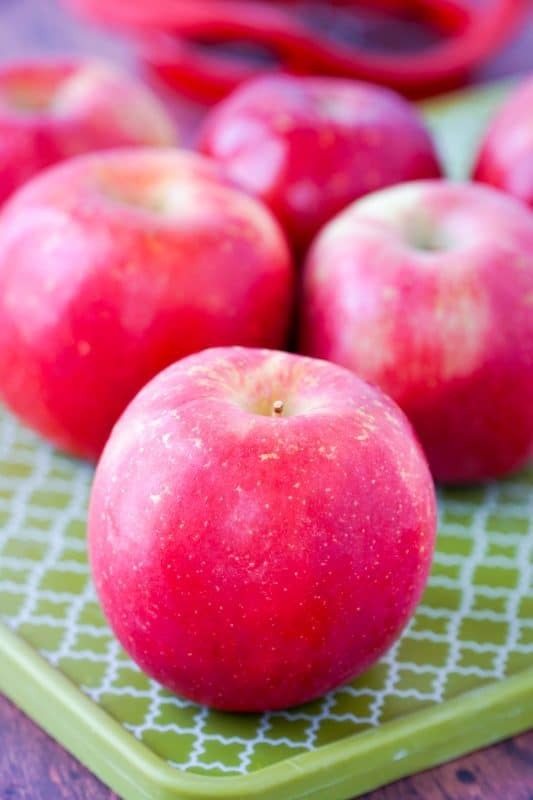 The original recipe for Apple Fries that we tried years ago called for Pink Lady Apples. Since our kids are kind of picky with their apple texture and the sweetness factor we opted for Fuji Apples which are our family favorite. They worked perfectly and browned up really well in the cast iron skillet. Other apple options include: Granny Smith, Golden Delicious, Pink Lady, Honey Crisp, Braeburn, Cortland, and of course Fuji. All hold up really well when fried and pair well with the cinnamon sugar mixture and Caramel Pecan Dulce De Leche Cream Dip. Yes, you most definitely can make apple fries in advance. Most steps are easy and use simple ingredients. 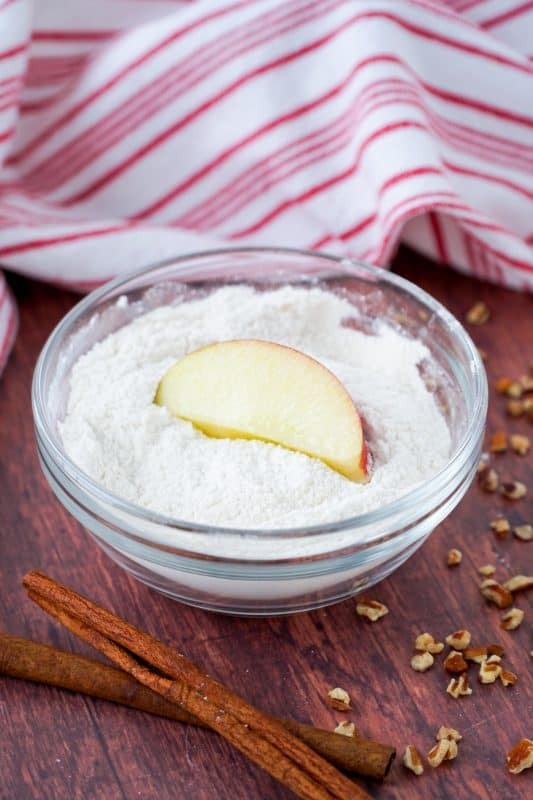 From mixing the cinnamon and sugar, to preparing your flour mixture – all steps can be done in advance with exception of the actual frying itself. When you are ready to do the actual frying gather everything that you have pre-made and this recipe will come together in no time at all. If you don’t have a lemon to slice up don’t fret… you probably have something else on hand in your fridge or pantry that can be used. Orange Juice, Apple Juice, Lemonade, or any juice that has citric acid makes a great alternative to sliced lemon. The juices slow down the enzymatic reaction of the apples and keep them from turning a yucky brown color. Soak your apples is Ginger Ale or Sprite – it gives them an extra flavor boost and keeps them looking white and delicious. Lemon Juice – you can always brush lemon juice directly onto the apples, or add the lemon juice directly to water. Our personal FAVORITE oil to use in this recipe is Coconut Oil. We think the flavor of the coconut compliments the apple fries perfectly. In addition to the extra flavor we’ve been told that Coconut oil contains natural saturated fats that increase the good HDL cholesterol in your body. It may also help turn the bad LDL cholesterol into a less harmful form. We’ve read that by increasing HDL, many experts believe that coconut oil could be good for heart health compared to many other fats. Our skillet of choice here at The Best Blog Recipes is a cast iron skillet. We have one for sweet recipes and another for savory dishes. There is nothing worse than making a delicious dessert for friends and family just to realize that is has a hint of flavor from the last dinner recipe that you made last week. If you don’t use cast iron skillets in your house that’s okay too. These can easily be fried up in a non-stick skillet. The one catch is that you have to make sure to use enough coconut oil to properly fry them or they will brown unevenly. Also watch your time as they will cook faster in a non-stick skillet. I’d suggest checking them at the 3 minute mark instead of the 5 when you use a cast iron skillet. 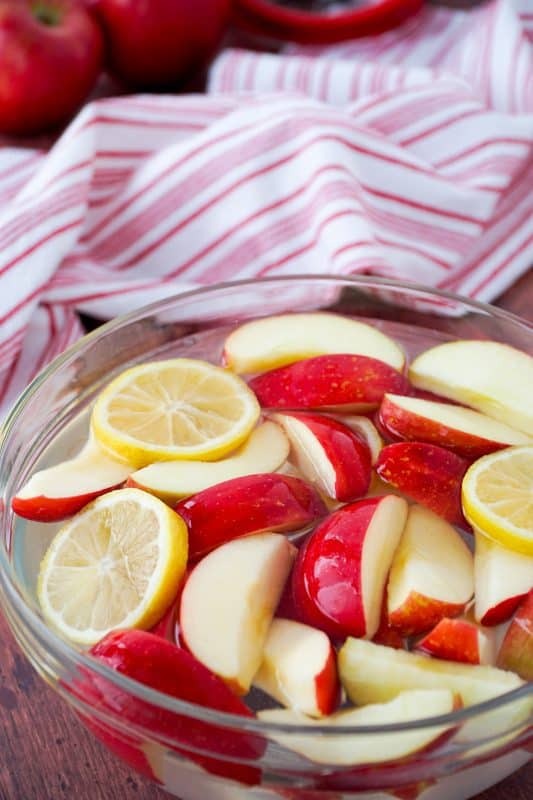 If you are short on time and don’t want to slice your apples and place them in a lemon water bath you can buy the pre-sliced apples from Costco or your local grocery store. They are easy to use and you won’t even be able to tell a difference when you serve up this recipe. Don’t skip the lemon water bath. This keeps your apples looking fresh until you are ready to cook them. If you don’t do this step you’ll be left with brown ugly apple slices that won’t look too appealing to your guests if they should decide to peek in the kitchen while you are cooking. Less is more when it comes to the flour sugar coating. If you use too much then it sometimes breaks off in yoru skillet and you are left with just apples without their delicious coating. Don’t forget to heat up your cream cheese and Dulce De Leche before stirring. This ensures that the mixture is smooth and combines well. It doesn’t take long for these apples to cook in the skillet. Fry for 5 minutes on each side, or until they are browned. 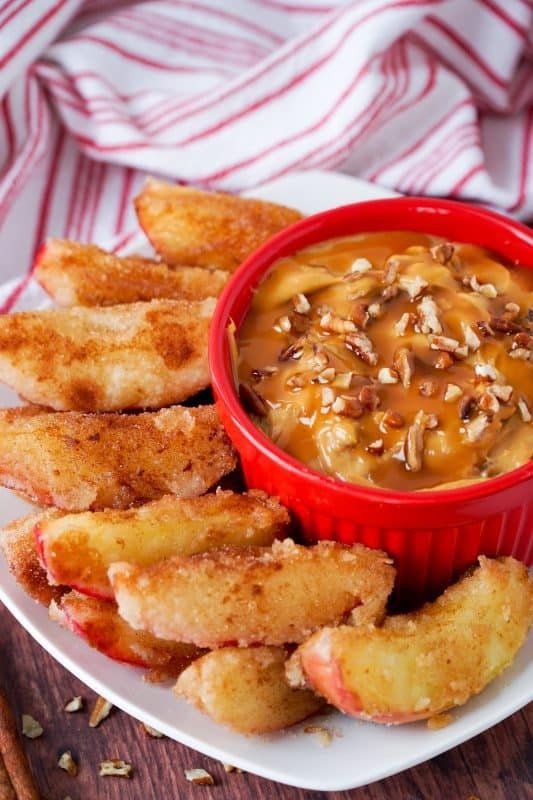 Apple Fries with Caramel Pecan Dulce De Leche Cream Dip is a fall favorite that is full of sliced apples, cinnamon, sugar, coconut oil, cream cheese, pecans, and your all time favorite thing… dulce de leche. Pour your water into a large bowl and add sliced lemon. Slice your apples using an apple slicer or knife. Immediately put apple slices in water with lemon. Once all apples are sliced and in the water lemon mixture, remove from bowl and place on a paper towel lined plate. In a separate bowl, mix 1 cup of flour and 1/2 cup of sugar with a whisk. Add sliced apples and flour sugar mixture to a gallon size ziplock bag. Shake well. In a skillet over medium heat melt coconut oil. 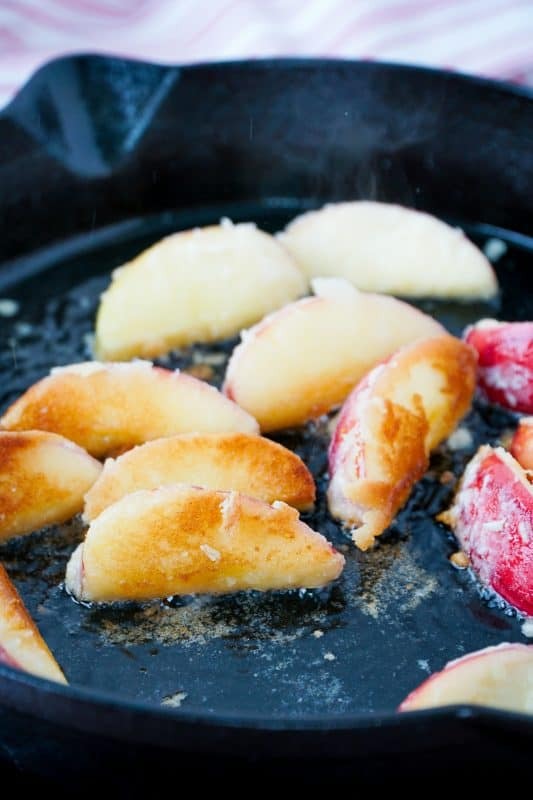 Add apple slices to skillet and let cook on one side until lightly browned. Turn over and let cook until other side is lightly browned. Remove apples to a paper towel lined plate. Set aside. 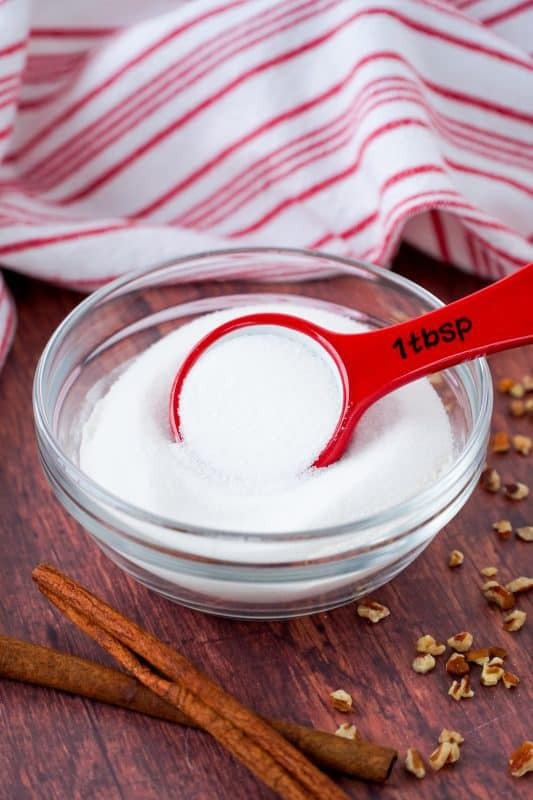 In a separate bowl add 1/2 cup sugar and 1/2 tablespoon cinnamon. Whisk together. Lightly sprinkle cinnamon sugar mixture over the apples. 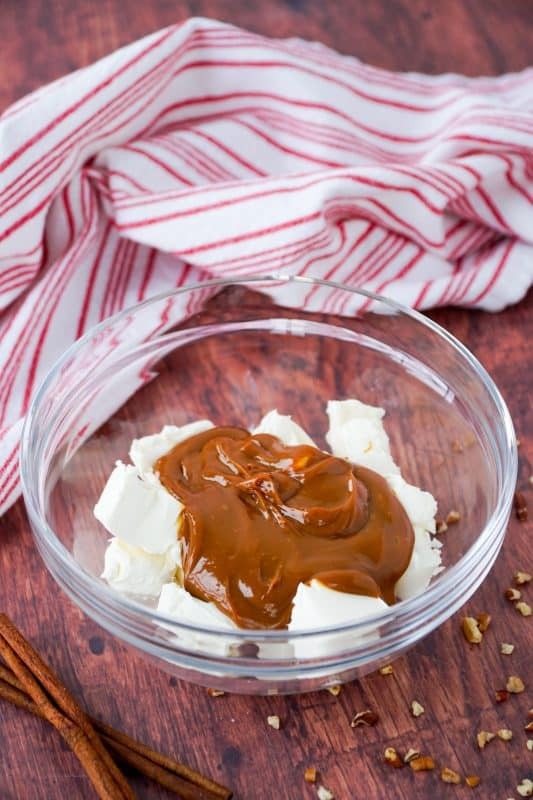 In a medium mixing bowl combine softened cream cheese and dulce de leche. Microwave for 25 seconds. Remove from microwave and stir well until no lumps remain. Mix in cool whip and pecans. Sprinkle chopped pecans on the top of the dip and serve with apples. *Optional: When serving drizzle caramel sauce over the top of the Caramel Cream Dip for an extra "wow" factor. We had apple fries when we were at the carnival this summer. The kids have been asking for them ever since. I am looking forward to trying this recipe over the weekend. The recipes look really good. Love the ones that seem perfect for fall. Oh my goodness all of these recipes look so good, and that apple bites especially look incredible! I’m sure you could – it would just change the texture!